One way to manage digital information is to classify it into a series of categories or a heirarchical taxonomy, and traditionally this was done manually by analysts, who would examine each new document and decide where it should fit. Building and maintaining taxonomies can also be labour intensive, as these will change over time (for a simple example, just consider how political parties change and divide, with factions appearing and disappearing). Search engine technology can be used to automate this classification process and the taxonomy information used as metadata, so that search results can be easily filtered by category, or automatically delivered to those interested in a particular area of the heirarchy. We’ve been working on an internal project to create a simple taxonomy manager, which we’re releasing today in a pre-alpha state as open source software. Clade lets you import, create and edit taxonomies in a browser-based interface and can then automatically classify a set of documents into the heirarchy you have defined, based on their content. 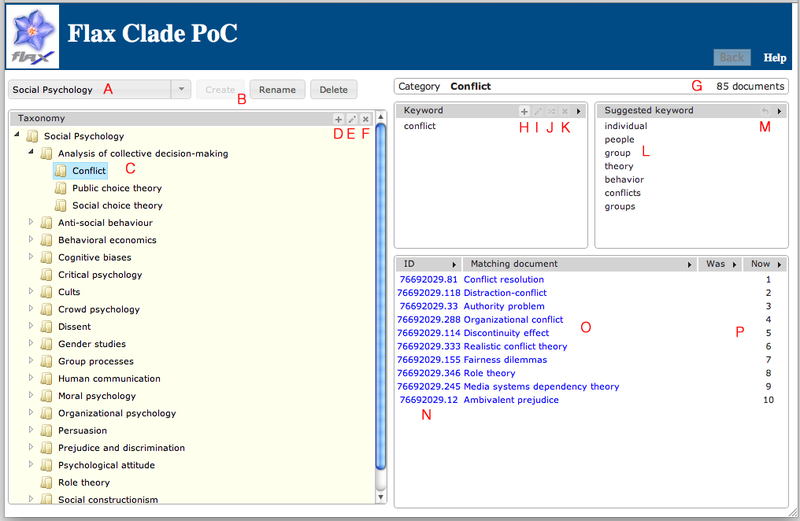 Each taxonomy node is defined by a set of keywords, and the system can also suggest further keywords from documents attached to each node. Clade is based on Apache Solr and the Stanford Natural Language Processing tools, and is written in Python and Java. You can run it on on either Unix/Linux or Windows platforms – do try it and let us know what you think, we’re very interested in any feedback especially from those who work with and manage taxonomies. The README file details how to install and download it. Still lots of innovation left in Cambridge despite the loss of Autonomy! Congratulations on the release of this very welcome application. Any thoughts about whether this could be used to manage the development of Managed Metadata schemas in SharePoint? We haven’t yet implemented a way of exporting the classifications, and importing is currently limited to CSV – but assuming one could work out a suitable integration method with Sharepoint there’s no reason why not. Great stuff, Charlie. If it’s not too leading a question, how would you position this relative to current proprietary offerings (i.e. any obvious gaps or advances over them)? @Tony – we haven’t carried out any comparative analysis with commercial products, however I can say that an earlier version of this tool was evaluated by a third party and stacked up very well against a commercial alternative in terms of the autoclassification performance, especially given that the commercial alternative is a far more mature product. Also, we couldn’t find many open source taxonomy tools and the ones we did find were rather overcomplicated, which is part of the reason we’ve released Clade. Hi Charlie, is Clade available on an open test platform too, so we can get an initial idea of how it works with no need to install the server ? Hi Lila, not currently, but we’ll see what we can do. We briefly touched on this area during our discussion yesterday. Would it be possible to see a demonstration at the next meeting? I’d also be interested to know if any interest had been shown in using this approach for extracting embedded image/video metadata for autoclassification. We are due to implement a media library in September which extracts EXIF/IPTC/XMP data to a Sharepoint library, and also allows us to merge new/amend metadata to a media derivative. Hi Alan, of course we’re happy to demo Clade. Regarding extraction of EXIF data, we’ve used the ImageMagick library to do this in the past, and once it’s extracted it could be used like any other metadata for classification, tagging, faceted search etc. That brings back all three expected fields to create the desired tuple for return. I am new to python, Clade, sunburnt and Solr so if anything I have stated here is wrong, please do not hesitate to correct me… just hoping to spare others some pain. Nice one Alexis! We’ve been hoping to develop Clade further at some point (perhaps by expanding the way classification is done to encompass more complicated expressions for each node) but we haven’t got around to it yet. You’re right about the dupes if you reclassify the same data, this would be a useful improvement. After several hours with the Stanford classifier, I have found that building distinct language models for each classification and then using log2 ngram probabilities was 3-4x more accurate then standard maxent used in Stanford’s system. Does the document content need to be stored locally or could use use it to classify web resources (i.e. it fetches the content and analyses it) ? Currently Clade classifies local documents – but with the addition of a crawler it could easily classify documents gathered from the Web. There are plenty of open source web crawlers out there – for targeted use we’re fans of Scrapy. Really nice tool, many thanks. Is there a way to set the number of responsive docs to be more than 10? I noticed that there a re a number of “FIX” comments in the taxonomy.py file where “10” seems to be hard coded. Ideally I’d like to be able to see all responsive docs if possible. Any help to achieve this would be appreciated. I am not a python developer. Thanks for the response. It worked very well upto about 200 results. Great to hear that you are working on a new release. I will check back frequently. In our case, our source docs are PDFs. I had to extract the text layer before I could index them. Having a module that could pick up a list of PDF files would be a great addition. Glad to hear it. Yes, it would be perfectly feasible to index PDFs, we’d use Apache Tika I suspect. I downloaded from Stanford nlp site for this version and replaced the current one. Seems work well. Try the latest Stanford NLP – as other posters have commented that seems to fix the issue. Hi Kanza, I think you’d be best asking the Stanford team as we’re not the authors of this software. But I am not understanding how Stanford NER package is used in clade. I went though clasfy.py. I’m very particular in understanding how Stanford NER has been used in taxonomy classification. When I went through documentation of Stanford NER and installed package basically it classify the sentence into location, person, organisation. how this information are used in taxonomy classification.